Knowing how to make cauliflower rice is a great trick to keep your family eating healthy. 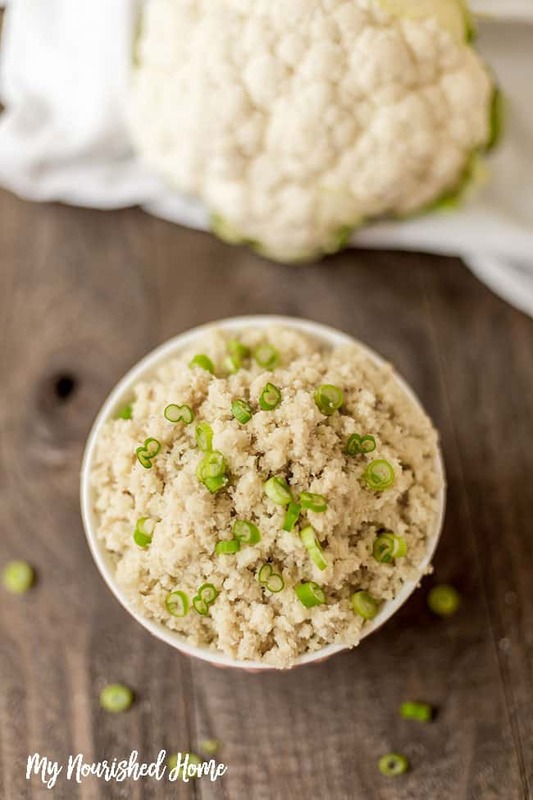 You can replace traditional rice with cauliflower rice in many recipes – and it is delicious as a side dish all by itself! 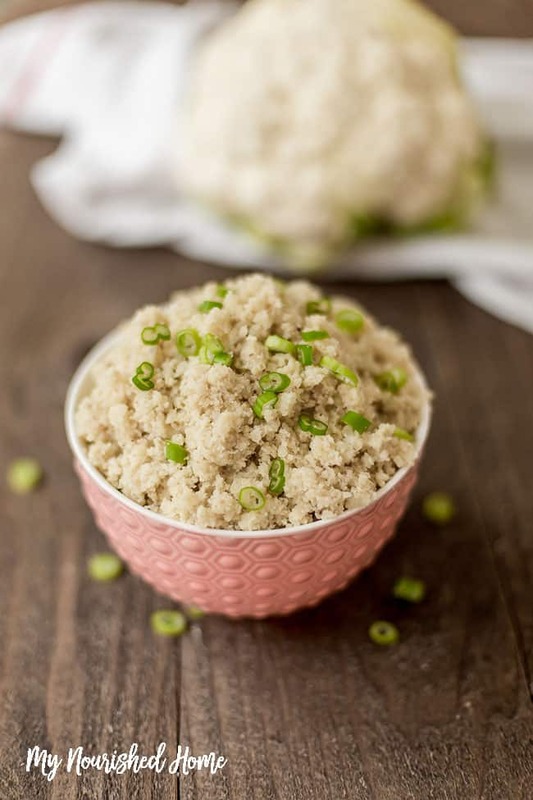 Many are hesitant to try out cauliflower rice as a replacement for traditional rice because they are apprehensive about the difference in flavor, but there is very little difference in the taste. Cooked, cauliflower takes on a savory, almost nutty flavor, much like regular rice. So the transition from one to the other is very easy, even for the healthy food skeptic. A few weeks ago I substituted cauliflower rice to make a healthy fried rice recipe but didn’t tell my family that I replaced it. After the meal, I pointed out the substitution and my little kids didn’t believe me. I can taste the subtle difference, as can my husband and oldest child – but we love cauliflower anyway. The fact that my little kids didn’t believe me that (’cause I would lie about veggies apparently) was totally fine with me. There is very little taste or texture difference in cauliflower rice than there is in traditional rice. The health benefits of cauliflower (and all vegetables!) 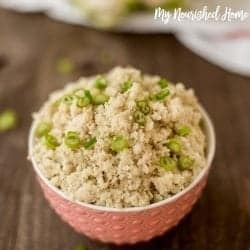 are so significant that there is no reason not to learn how to make cauliflower rice! Making Cauliflower rice as a healthy replacement ingredient is incredibly popular right now and is something that I am trying out more often in order to incorporate more veggies into my family’s diet. If you have kids that are hesitant to eat veggies then this would be the perfect way to try and sneak them in. 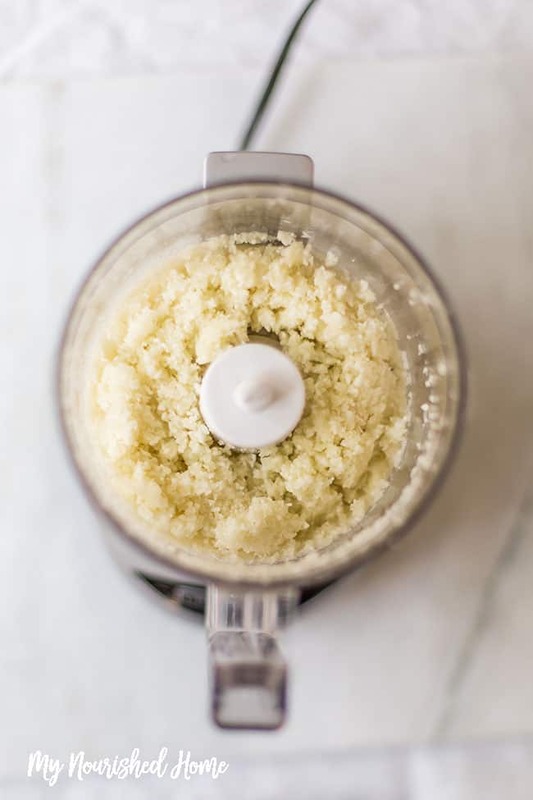 We use a smashed garlic clove, salt, and pepper to season the cauliflower rice. To cook the rice you need to heat oil in a skillet and then add the cauliflower and garlic. The moisture from the cauliflower will evaporate as it cooks but watch it closely because as the cauliflower begins to cook it will toast quickly. You don’t want it to burn! Looking for More Healthy Rice Recipes? 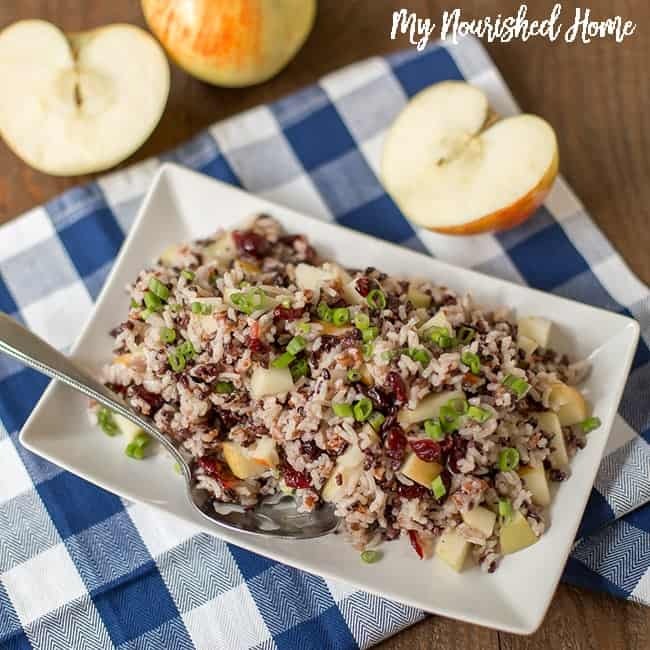 This Apple Cranberry Rice Pilaf is so easy and really delicious. We often serve it with baked or grilled chicken on top as a complete meal. But is also fabulous as a side dish. 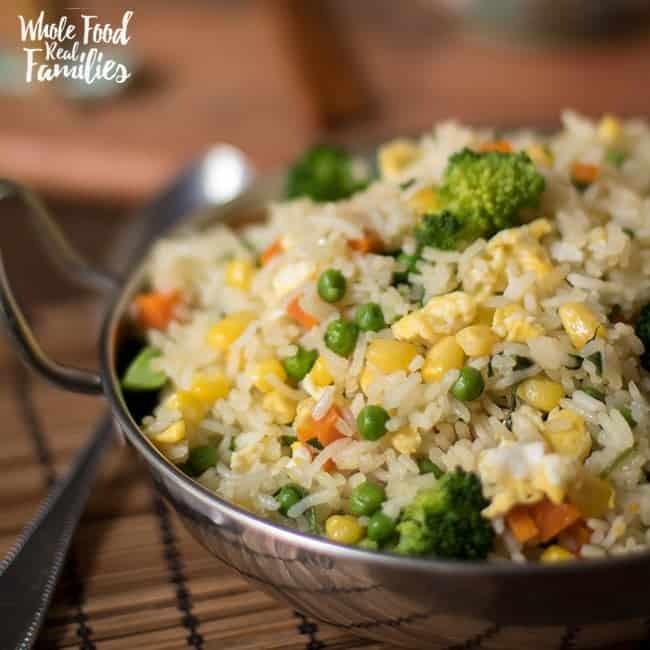 This easy and Healthy Vegetable Fried Rice is on regular rotation at our house. Not only is it delicious for dinner, but it heats up great for lunches during the week. In a food processor and in batches process the pieces of cauliflower until they are fine, and resemble rice. Repeat till done. Heat oil in a large skillet, add the cauliflower rice and garlic and let it cook until the moisture from the cauliflower has evaporated. Start at high heat, and lower the heat once the cauliflower started to turn color and brown a bit. (Toasting adds lots of flavor - burning does not. So watch it closely!) This can take anywhere between 10 to 15 minutes, depending how much rice you're making. Test the consistency of the rice, if you feel that the cauliflower grains are soft, then you know it's cooked. Season with plenty of salt and pepper. Remove the garlic prior to serving. I need to try this out. My husband is diabetic so I have been trying other things other than the potatoes he loves so much as a side. We do use brown rice, but this sounds so much better for his blood sugars. What a great idea! I never would have thought to use cauliflower in place of rice. This is something I will definitely have to try. Thanks!